To our great delight, Lyra discovers a single greenish cell wedged firmly in the ship’s rudder assembly – the strange malfunction of our steering and elevator systems now demystified. When she attempts to free the organism with a length of hemp line the protist takes her on a merry jaunt as she grasps the tether with all her strength. So as not to lose my prize naturalist, I know we will need a quick plan to lure the green cell back to the Cyclops, get it close enough for capture. My mind was racing. Perhaps this energetic green organism is driven by the same chemical responses as the green paramecium. I turn to the ship’s controls and power up the external lamps. Sure enough, as I had hoped, the organism changes its mad course and heads toward the light, towards the ship, and safety for Lyra! 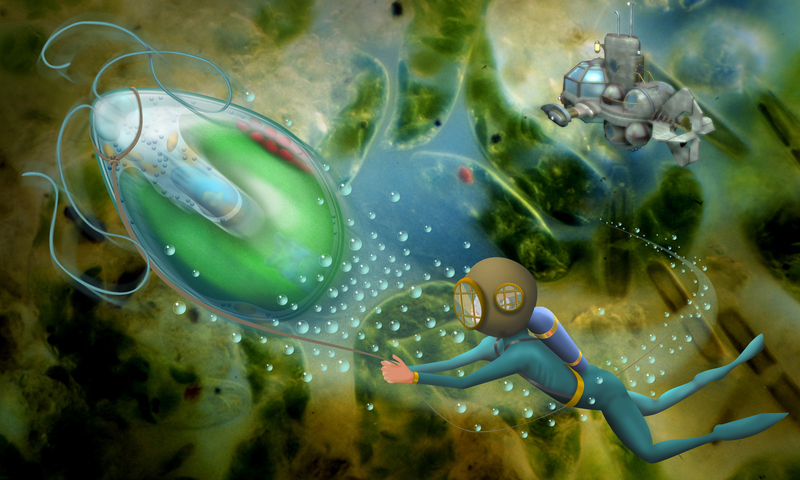 Lyra is now safely aboard the Cyclops again and our new mascot – the green algae cell – is being observed in a glass enclosure. It has the usual characteristics of a single cell: a roundish clear body filled with cytoplasm. This one has two flagella, which it uses like propellers for moving about. Each flagellum joins the body where we observe a cluster of red granules. We suspect this red “eye spot” is sensitive to the presence of light, and steers the cell by sending chemical signals to the flagella. Also inside the cell is a nucleus, a number of whitish starch bodies, and a horseshoe-shaped green structure – the organism’s chloroplast. 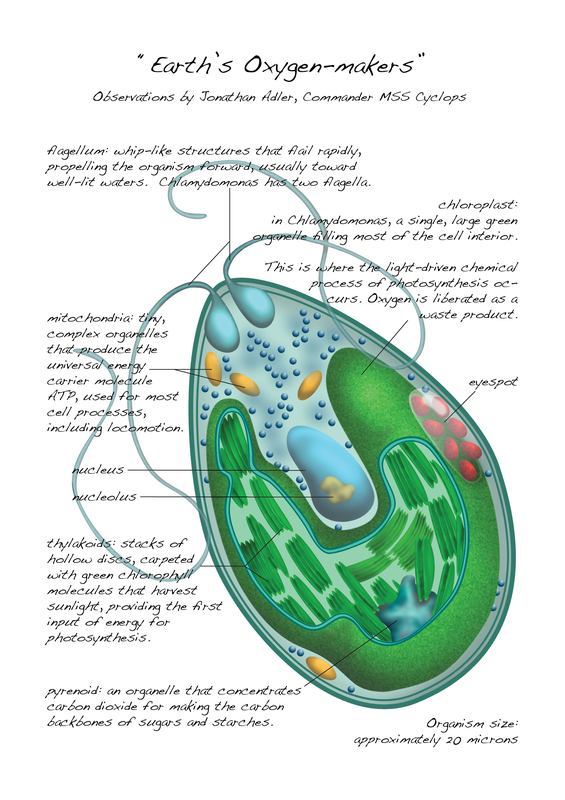 The chloroplast seems to be the center of a great deal of biochemical activity within this organism. When light is shined upon the chloroplast the oxygen levels in the tank begin to rise and starch bodies are produced. Lyra believes we are watching the process of photosynthesis as it occurs. She also suggests that a small menagerie of these organisms might serve us by producing all the oxygen we could ever need! It appears that a happy accident has provided us with a solution to our oxygen problem. As we continue our mission I am in awe. We have observed that every green cell in this life-rich world is a living factory, producing oxygen and the molecules for life. It is here in the micro world, I humbly realize, that the foundations of the living world begin! This entry was posted in Novel Blog and tagged chlamydomonas, ecology, microorganisms, microscopicmonsters, science, science fiction on July 27, 2018 by Eric. this website is my aspiration, rattling good pattern and perfect written content.